“Experiencing a country through its cities is like judging a book by its cover.” ~yours truly. 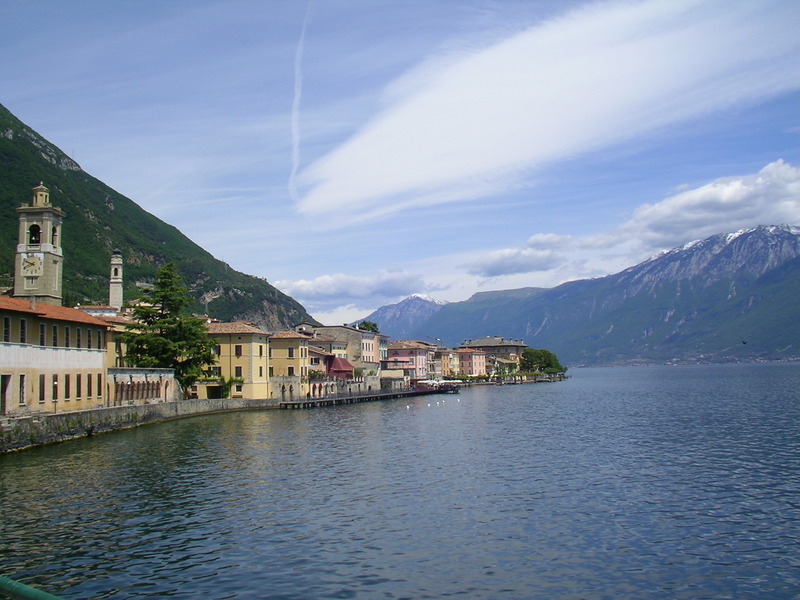 Welcome to Gargnano. An unassuming little village on the northern shores of Lake Garda in Italy, away from the touristy towns of Desenzano and Sirmione. Here everyone knows everyone else. Two days is how long it takes for the locals to know me, despite my broken language. A favorite pastime of both visitors and locals is sitting by the water and feeding the ducks. I’m fascinated watching them swim and hop ashore in crowds of three, presumably a polygamous setting. It is a tranquil place for bird-watching, I see many of what appear to be pink-headed pigeons. I can tell the time of day by the color of the lake, and the season by the amount of snow on the mountain peaks. As aperitivo starts (the Italian custom of pre-dinner drinks & snacks), a lot of foreign faces begin to meddle with Gargnano’s isolated existence. The culprit is a tour boat from the southern villages. These ‘tourists’ remind me of Brescia, the city I traveled past to reach this lovely village. It’s just a bus-ride away geographically, but demographically (in lifestyle and in age), probably a few decades. With the onset of darkness, the visitors start to disappear into the far shores of the lake and I return to what feels like my own little village. Someday, I must return to live more of this simple, slow and beautiful life. Thanks Madeeha 🙂 It’s my amateur sanyo camera, so credit for all the beauty goes to the place itself! Love the pictures and the description 🙂 How did you zero down to such beautiful and unexplored places? I mean these places are not usually covered in tourist packages I believe….so how and why did you select them? Its beautiful. i cant think of anything else to say! Beautiful pictures my new friend. Thank you for sharing the link to your site on my facebook wall http://www.facebook.com/eurotravelogue . Have a wonderful day and keep the pics coming! Thanks Jeff 🙂 See you around often! Definitely pining for Italy now. I love how you can find those moments in Italy where you can become a local. I think it must be the Italian spirit to make you feel at home. It’s absolutely the Italian spirit and I loved it 🙂 Thanks for stopping by Suzy! Let me read all your postings one by one..I am far away from Delhi and in the midst of Sahara desert in Algeria , the net is too slow ..and cant open blogs most of the time…very sad.. Thanks Ushnish and welcome to The Shooting Star 🙂 Wow, you lived in Northern Italy? I’m really very jealous. Been dreaming of living there, hopefully someday I will. Algeria sounds exotic! Hope to read about your desert adventures on your blog. Previous PostReflections on Lake Garda. Next PostInnsbruck: Capital of The Alps.